Continuing on with my reading of the 8 different books in the Doctor Who Monster Collection, we've gone from the Daleks to the Weeping Angels. Now I have to admit that I was a little worried about how this would turn out. And I have a number of reasons for this. The biggest really relates to how the Weeping Angels have always been very "visual" villains. Their very nature is related to one's ability to see them since this is the only time that they don't move. And while you can still imagine their distinct stone appearance and how they are frozen in different poses as part of the experience of reading the book, it's still not quite the same thing. And so one can only imagine the challenges of trying to capture their distinctive nature within the context of a book. The book was a lighter romp than the last one, but still a decent adventure. The writer did a decent job of taking on the Weeping Angels and trying to find a way to keep them interesting. If anything, I actually liked this story a bit more than that whole planet full of Weeping Angel type creatures. 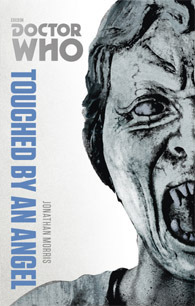 Synopsis: Touched by an Angel is Doctor Who novel written by Jonathan Morris. It was originally released in 2011 but it was re-released as part of the Monster Collection in 2014. April 10, 2003, Rebecca Whitaker gets into a traffic accident with a lorry truck. Before her death, she catches a glimpse of something that looks like a statue, somehow getting closer to her. But October 2011, her husband Mark is still mourning her death. But as he struggles to get through the days, he receives a mysterious package written in his own handwriting. On his way home, he keeps catching glimpses of a statue somehow standing behind in in various CCTV screens, but he sees nothing when he turns around. After a brief encounter with the Doctor (together with the already-married Amy and Rory), Mark gets sent back into the past by the angel. But instead of sending him back several decades as is typical of the Angels, he was only sent back 17 years - well within his own timeline. And he discovers that the letter that had been sent to him was a series of instructions from a different version of himself. But at the very end is a statement that gives Mark purpose - a chance to save Rebecca from dying. And now the Doctor has to stop him from creating a paradox that the Weeping Angels plan to feed on. First, interesting spin on the Weeping Angels. Long-term Doctor Who fans know that they feed on one's potential life energy by throwing you back into time - killing you nicely by allowing you to live to death. The Weeping Angels in this book appear to be of a different breed entirely - one that focuses on feeding off time paradoxes for some reason. No need to really question why this is so, I suppose. Let's take it as a given since it's a pretty interesting premise. A large segment of the book is told from Mark's perspective as we follow him through his life. The list that he's following is a comprehensive series of instructions that have him interfering with his own timeline. But since these are things that Mark had already remembered happening (such as his lost wallet showing up at his hotel in Rome), the Doctor is convinced that they have to follow the list in order to reinforce the timeline. But of course there's the question of where the list came from in the first place - and this is all part of the blissful headache of a time paradox. We know that cause doesn't necessarily have to precede effect in such matters. And you can get that feeling that the author must have been feeling a little smug about coming up with this little time travel trap. Despite the somewhat convoluted nature of the core dilemma in this book, the author does a decent job of not overwhelming you as a reader with too much time travel pseudo science. Sure, the Doctor makes mention of a Blinovich effect here and there, but for the most part you have to keep up with the general action. And you know how Amy and Rory are pretty good at being rather active companions are able to keep pace with the Doctor. The humorous bits were also pretty good and there were some nice moments for the Doctor, Amy and Rory as needed. I'm not saying that it was great all throughout - there were just some really nice bits that stood out here and there. Mark was a bit of a limited character given his own focus on saving Rebecca, but kudos to him for managing from hiding this particular fact from the Doctor so long. The Angels had their own scary bits, but it's just not quite the same reading about them blinking in and out of existence compared to seeing it on TV. That's not a failing of the author - I think he managed a pretty decent job of trying to describe the Angels and he made good use of various strange lighting conditions that gave the Angels a lot of leeway. Plus there's the fact that most of the book is spent trying to get away from 6 different angels, which is quite the respectable numbers. Doctor Who: Touched By An Angel is a good Weeping Angel Adventure but not necessarily the greatest Doctor Who adventure captured in a book. It makes for light reading and a good little escape but it's nothing to overly contemplate for hours on end. So it still gets a good 3.5 instances of Mark nearly corrupting his timeline out of a possible 5.